"Today, we've got a pair of Canon point-and-shoots to show you. 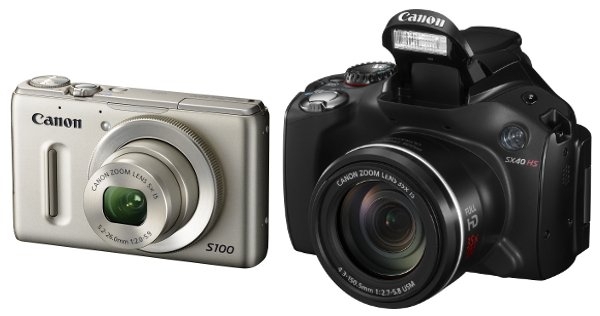 The S100 is the successor to the highly regarded S95, while the SX40 HS takes on the super-zoom market with its 35x lens. Both cameras use the company's new DIGIC 5 image processor, which brings high-speed burst shooting and 1080p video to the party." Canon has launched a pair of high-end compacts, both of which are upgrades to popular cameras. The S100 is an update to the S95, which features a new 12 megapixel CMOS sensor which is made in-house by Canon, a new 5x optically stabilised 24-120mm equivalent f/2.0-5.9 lens, and now offers 1080p video at 24 FPS. The LCD is the same 3" HVGA affair, as is the wonderful front control ring, but the new version also adds GPS and a high speed movie mode (not too different from the HS line of compacts. It can also do a burst of 8 shots at 9.6 FPS. Available in November for US$440, in both titanium (yuck) and classic black. Check out DPReview's preview as well! The SX40 HS has a pretty amazing 35x optically stabilised 24-840mm f/2.7-5.8 lens, a 12 megapixel CMOS sensor, a 2.7" articulated LCD, and 1080p videos at 24 FPS. The camera can also do the same high speed videos as implied by the HS moniker, and like the S100, features an 8 shot burst mode, but at a higher 10 FPS. Available in late September for US$440.